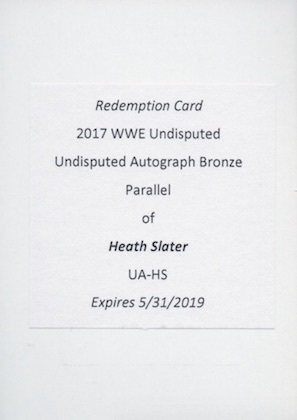 Maintaining its role as the high-end collecting option in wrestling, 2017 Topps WWE Undisputed again offers a hit-per-pack format. Matching the number of signed cards from 2016, every box totals eight autographs and two relic cards. 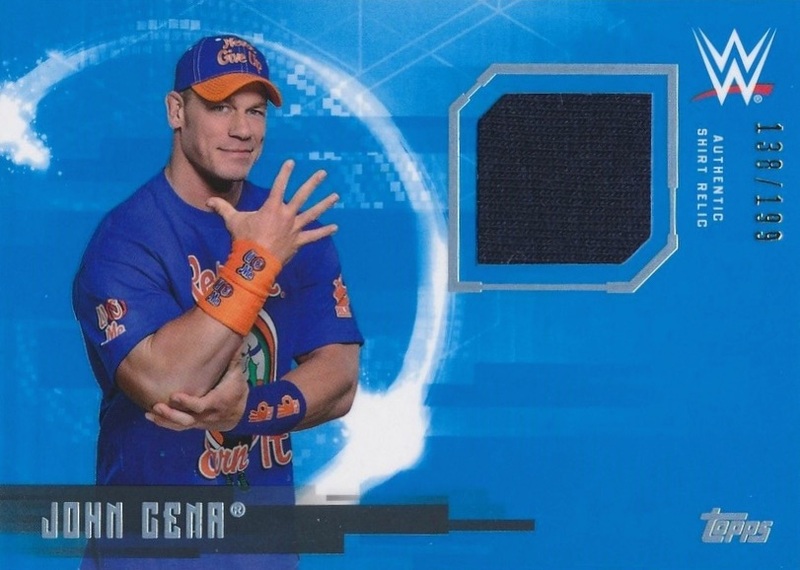 Despite being hit-focused, 2017 Topps WWE Undisputed Wrestling still features a true base set with four premium base or parallel cards in every pack. The checklist highlights 70 top names including subjects from NXT, Raw and SmackDown Live. Limited parallels consist of Bronze (#/99), Silver (#/50), Green (#/25), Gold (#/10), Red (1/1), and Printing Plates (1/1). 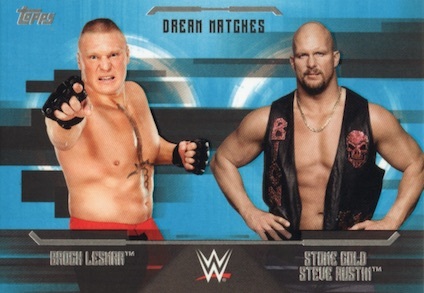 Closing out the non-hit cards, the Dream Matches insert delivers hypothetical showdowns that never materialized, while Women's Division looks to the all-time female stars. The standard inserts also mirror the base parallel options. 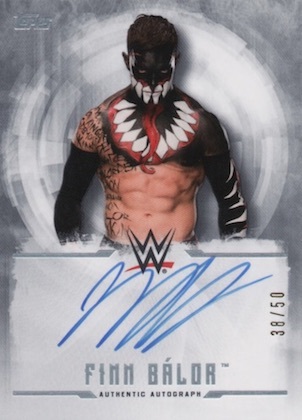 Covering the top options from the men's and women's division, the main 2017 Topps WWE Undisputed Wrestling Autographs insert features the same parallels as the base set as well as a Black (#/5) version. Dual Autographs, numbered to 25 copies, and Triple Autographs, numbered to ten, provide more signed inserts along with a one-of-one Tribute Cut Signatures set. 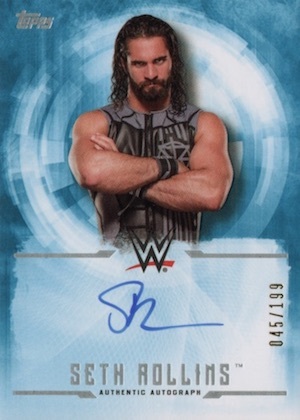 In addition, collectors can find booklet cards in 2017 Topps WWE Undisputed Wrestling with Autographed Kiss & Shirt Relic Books and Quad Autograph Books, both numbered to five copies. Worn shirt swatches are also in the mix with base Undisputed Relics and Autograph Relics. Both of these memorabilia inserts feature Silver (#/50), Green (#/25), Gold (#/10), and Red (1/1) parallels. PARALLEL CARDS: Bronze #/99, Silver #/50, Green #/25, Gold #/10, Red 1/1, Printing Plates 1/1. 56 cards. Serial numbered. Shop on eBay. PARALLEL CARDS: Bronze #/99, Silver #/50, Green #/25, Gold #/10, Black #/5, Red 1/1, Printing Plates 1/1. 4 cards. Serial Numbered #/5. Shop on eBay. 43 cards. Serial numbered. Shop on eBay. PARALLEL CARDS: Silver #/50, Green #/25, Gold #/10, Red 1/1. 37 cards. Serial numbered. Shop on eBay. Good: Autograph lineup is pretty stacked; every hit is numbered; quality look and feel throughout most of the set. Bad: Some top names have sticker autographs and all auto relics are stickers; blue-heavy design is perhaps a bit too much. The Bottom Line: Many times a product is viewed as “high-end” simply because it is loaded with a bunch of hits and has a high price point. 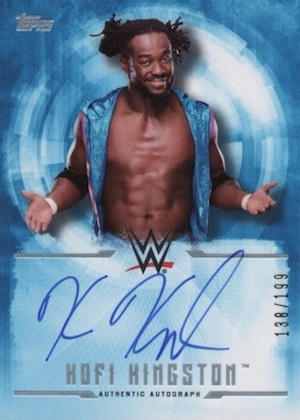 2017 Topps WWE Undisputed is expensive, but the cards themselves are very attractive. When you combine that with an autograph checklist that balances legends with current and future stars, it makes for a pretty strong release. I like the color blue. I just wanted to state that initially. Seeing the primary design, bathed in a rich blue, was jarring for me. I kept thinking that it was insane how many blue parallels were in the box. The Women’s Division set goes even further by not including any white in the background. Now that I have gotten over my initial shock, I can appreciate the design a bit more. Unlike 2016, the natural background is completely gone and replaced with a circular design, which does a good job highlighting the subject. I still think the deep blue is perhaps a little too bold, but I’m sure it works well for many others. 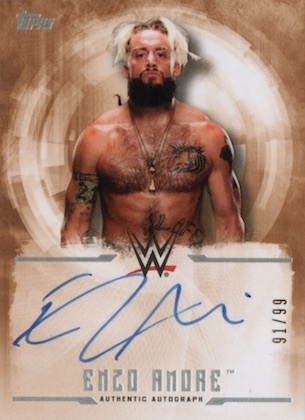 Carrying over to the main autograph set, as well, the design incorporates a white signing box for the on-card signatures, and a few sticker autographs. At this price, stickers are disappointing, but that is especially true when talking about names like Goldberg and the Undertaker. Likewise, the autograph relics and multi-subject cards also display stickers, which has been the case for a while. Still a letdown, for sure, but mostly hard-signed is better than the alternative. The weakest part of the set to me is the relic insert. It’s just so plain and seems to be there just to fill the “hit” spot more than anything else. They are also less appealing since they are essentially just the auto relic without the sticker. There really is not much else as far as design other than the inserts/subsets and the multi-signed cards, and even those mostly stick to the script. The set does a good job of staying close to the main design throughout. 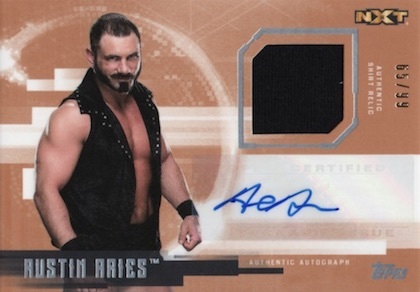 While it has seen ups and downs in prior releases, the 2017 Topps WWE Undisputed autograph checklist is tough to beat this year. Multiple legends beef up the offerings, including the aforementioned Goldberg and Undertaker. Of course, many of the current stars are also available and seeing strong interest. On the flip side are some less popular options, but that is the gamble. While more of a collecting preference, I do wish they would just roll the two non-hit "inserts" into the main set numbering. Combined, the Women’s Division and Dream Matches would nearly bring the smaller base set to 100 total cards. Selling for around $230+ per box, the product is not affordable for everyone, but eight autographs can help with value quite a bit even if the two relics do not. I would like to see a bit more effort from the relics (or removal and a cheaper box price). Value would be even better if all the base autographs were hard-signed. Even still, most are on-card and all the autographs are relatively limited. As an example, our box only had autographs that were numbered to 199 or less, which is nice. You might think of Undisputed as one-note, but it’s the rare premium set that still feels like a full release, and that makes it more exciting to me. The many colors that joined the main blue provided a good spectrum, and the various designs, while similar, still offered subtle differences. The relic cards remain disappointing, in my opinion, but the rest of the set had enough to overcome this for me. All wwe fans enjoy there experience and meet & greet with superstars and divas abd get to know them and sign autographs. This checklist is insanely good. Probably the best Undisputed set so far with Brock, Goldberg, Undertaker, Sting and Bret Hart and that’s just the legends. Disappointed to not have a Kane relic or auto in the set though he is my favourite. He has been overlooked in sets for a long time. 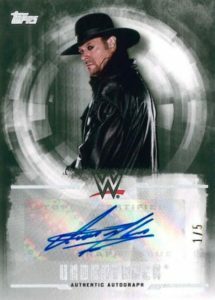 For a high end product with big name’s Topps couldn’t mail Undertaker, Goldberg or a few others the cards? Stickers? for $220 a box? 75% is on-card but the signatures are getting lazy and more lazy. So much product out there everyone’s signature is RR, SR, DA etc. Pathetic. hello, i was woundering if you could help me. i have a Bret hart card from Undisouted 2017 and i dont know the value of the card. is a Black parallel autograph. #UABH. nr 4/5. its graded 9.5 gem mint and a 10 on the autograph. Recently, the base autograph for Hart has been selling for about $20-30 and a BGS 9.5 sold for $67 in January 2019. Since you have the Black at 9.5, I’d say at least $75-100+. Maybe a bit more if you have the right buyer.